Well, well – it’s been a while, and I’m sorry! I’m finally back in Boston, and it’s been mad – since I’ve been back, we’ve had a friend and then my sister visiting, and been away to New York for a few days. Hectic. So, to make it up to you, here’s not one, but two recipes – both based in different ways on dishes from two restaurants I love in Boston. While our friend Ben was visiting, we went for dinner at Redbones BBQ in Davis Square, which is a great restaurant with both great food and a really fun atmosphere. For the uninitiated among you, BBQ here is not what you do in your garden (in the rain) in England, but rather a way of preparing and cooking meat – more as in BBQ sauce/seasoning. What you do in your garden is grilling – and what you do under the grill is broiling… Keeping up? We had a great meal, and left with a pile of leftover smoked brisket and baby back ribs – so I decided to make hash with the leftovers. Hash is something I’ve only really discovered since moving to the States – in the UK, it is really associated with corned beef from a tin, and not particularly appetising. It was popular during and after WWII because fresh meat was not always readily available, and corned beef hash became an economical way to feed a family. Economical certainly – but not especially inspiring. So, imagine my delight to discover that over here, it is often on the menu with meat that has never been near a tin – either freshly made corned beef, or, even better in my opinion, leftover barbecue, pulled pork, brisket etc etc. 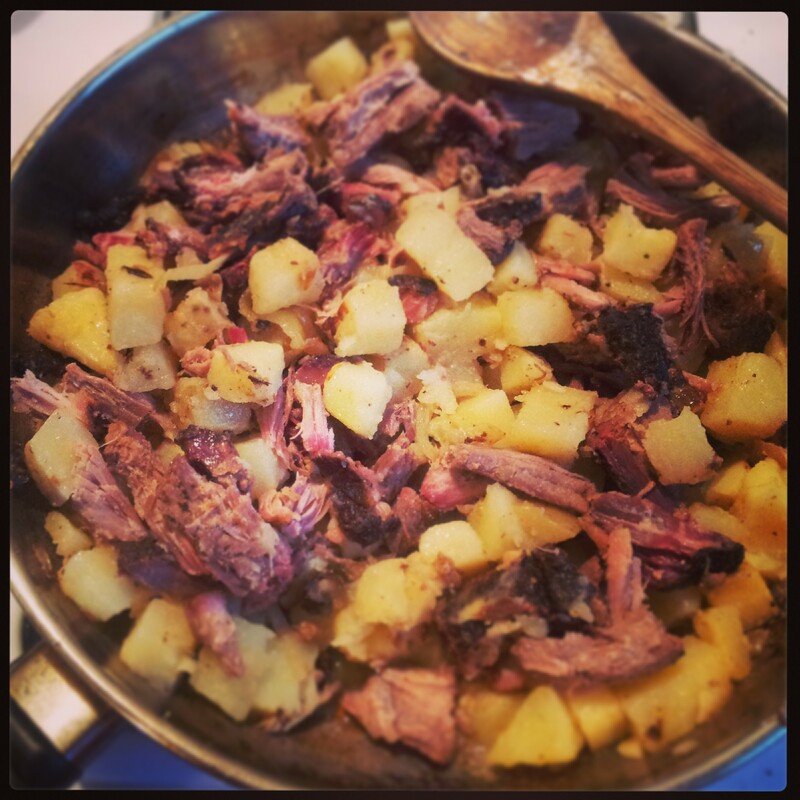 What hasn’t changed from WWII days is that hash is still a very economical option – it is really best made with leftovers, and is a great way to use up leftover meat, especially if you have bits of different leftover meats from say a BBQ/grill. It’s also very versatile – the basic components are meat, potatoes and usually onions, but you can add lots of other things to it, as you wish. It’s great for any time of the day, and is often served for brunch with a fried egg on top (or for dinner with an egg on top…). For mine, I added some black beans, and some dried chipotle, which I thought went well with the leftover BBQ meat. To go alongside this, I recreated a dish from a fantastic tapas restaurant in Boston – Toro. It’s somewhere we love to eat, and in fact we first went on my very first trip to Boston – and have been back several times since. The food is amazing – encompassing all the old favourites, alongside more unusual offerings such as crispy pork belly with roasted pumpkin, crispy brussel sprouts, chantenay carrots and kimchi vegetables, or, our favourite last time, Kabayaki glazed beef short ribs with chilled farro, cucumbers, radish and hazelnuts. The food is immaculate – perfectly balanced and incredibly delicious; we have never had a bad plate there. However, as we were finishing our first visit, the table to one side of us were getting very excited over their soon-to-arrive order of grilled corn with alioli, lime, espelette pepper and aged cheese. Dubbed ‘La Especialidad de la Casa’ on the menu, we had somehow missed this and asked what the fuss was about. The table next to us waxed lyrical, and we knew that on our next visit, we had to try the corn! We duly did – and it was fantastic. So, so simple, but incredibly delicious, and I have wanted to try to recreate it for a while at home. Mine wasn’t as good as Toro’s, of course, but I was pleased and it brought back great memories for us both! If using raw potatoes, cut into halves and place in a saucepan. Cover with cold water and add a little salt, then bring to the boil and simmer until fairly soft but not falling apart – 5-10 minutes. Drain the potatoes, and allow to cool until they’re cool enough to be handled. If using leftover potatoes, skip this step. Cut the potatoes into small cubes. Heat a little oil in a frying pan over a medium heat, and fry the potatoes until they begin to brown. Add the meat, onions, beans, chipotles and beef stock, and cook until the stock has reduced and the onions are soft. The potatoes should still be slightly crisp. Season with salt and freshly ground pepper. Just before the hash is finished, fry two eggs. 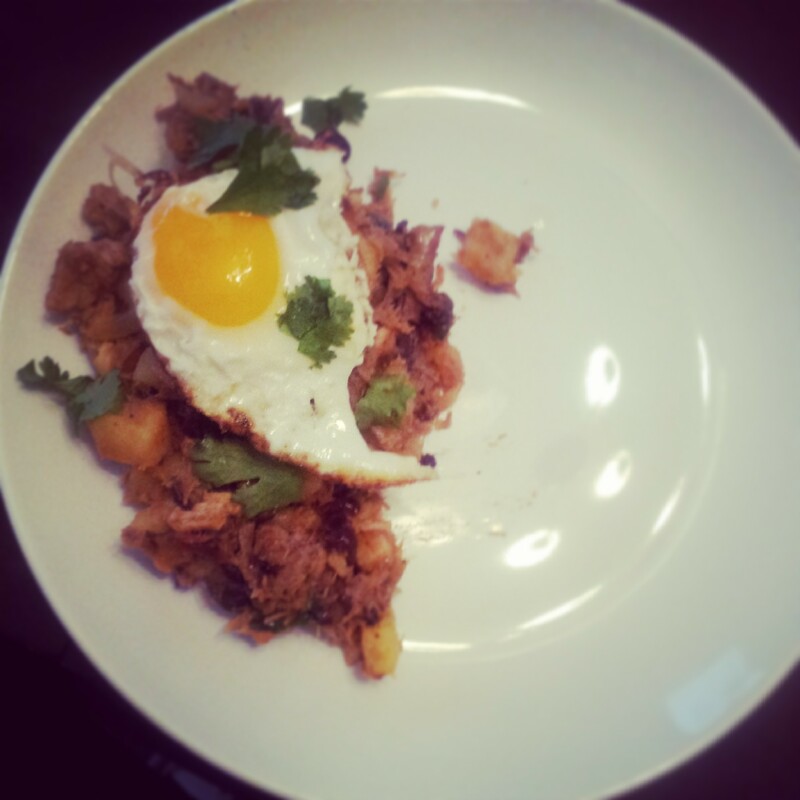 Serve the hash, topped with a fried egg, and garnished with coriander. Heat a griddle pan over a high heat until very hot. 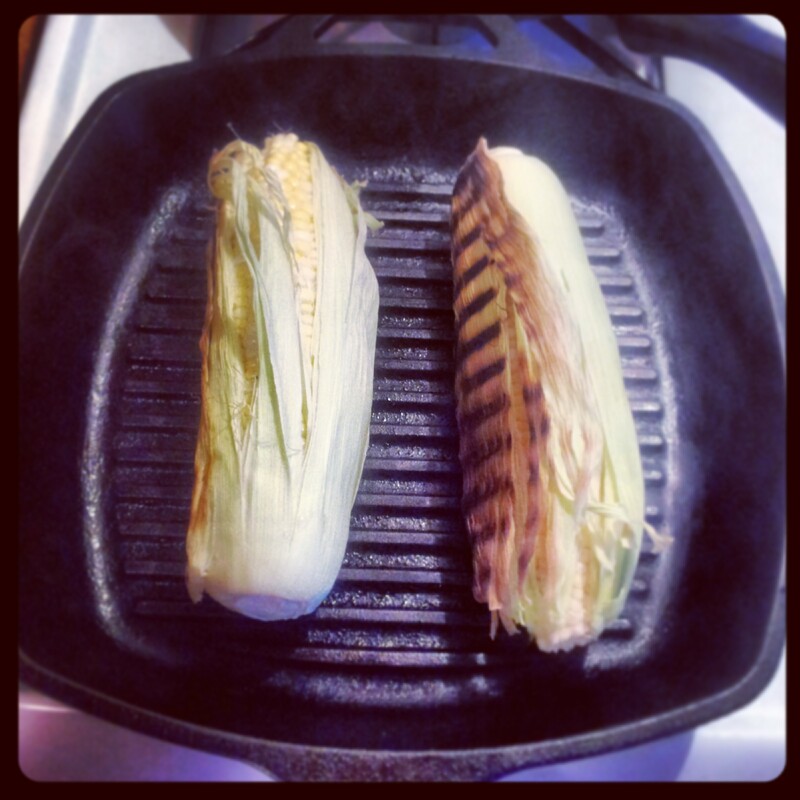 Place the corn in its husks on the griddle, and cook for around 15 minutes. 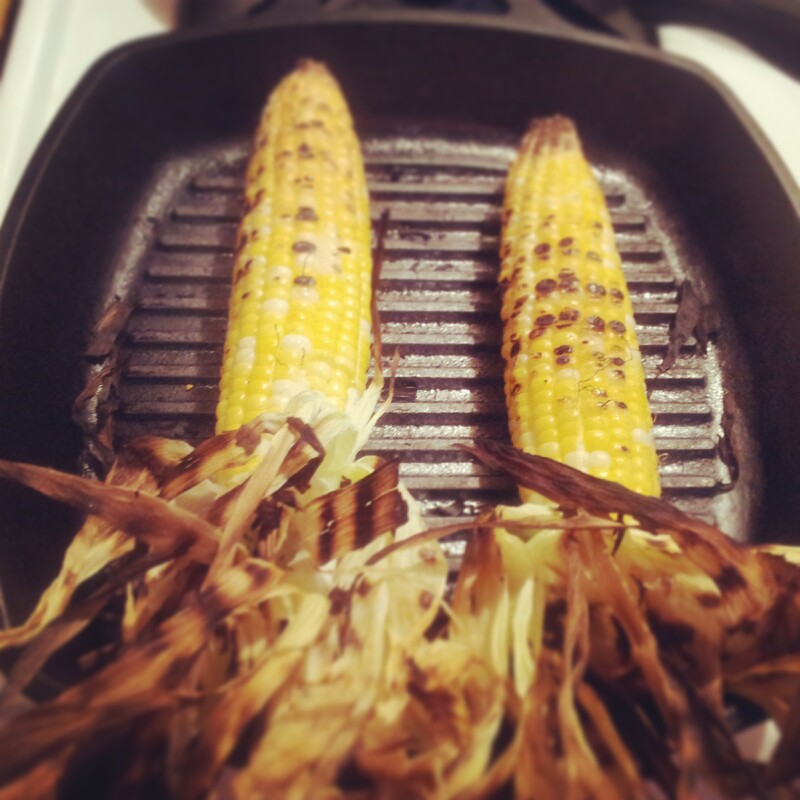 Once the husks start to blacken, peel them back and put the corn back on the griddle until the kernels are slightly charred. In the meantime, make the aioli. 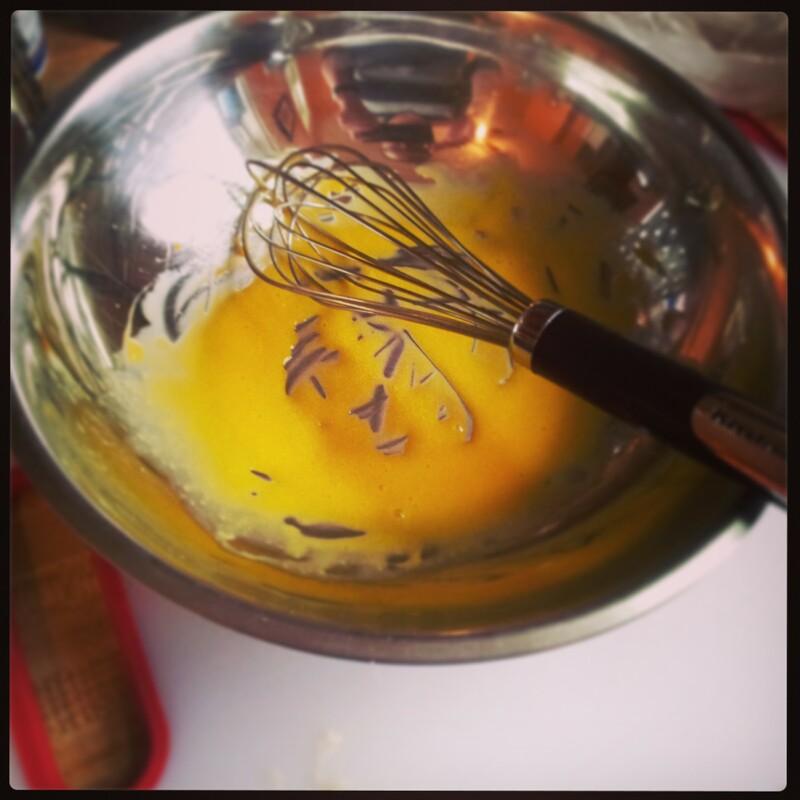 Place the egg yolks in a bowl and beat well with a whisk. Stir in the garlic. 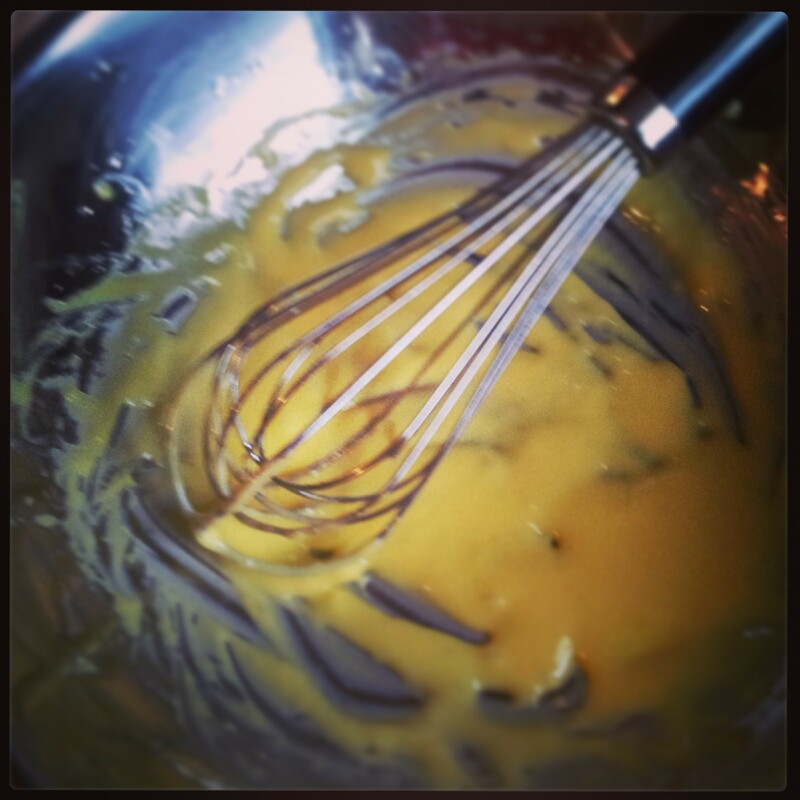 Gradually add the oil to the yolks in a thin stream, beating constantly. 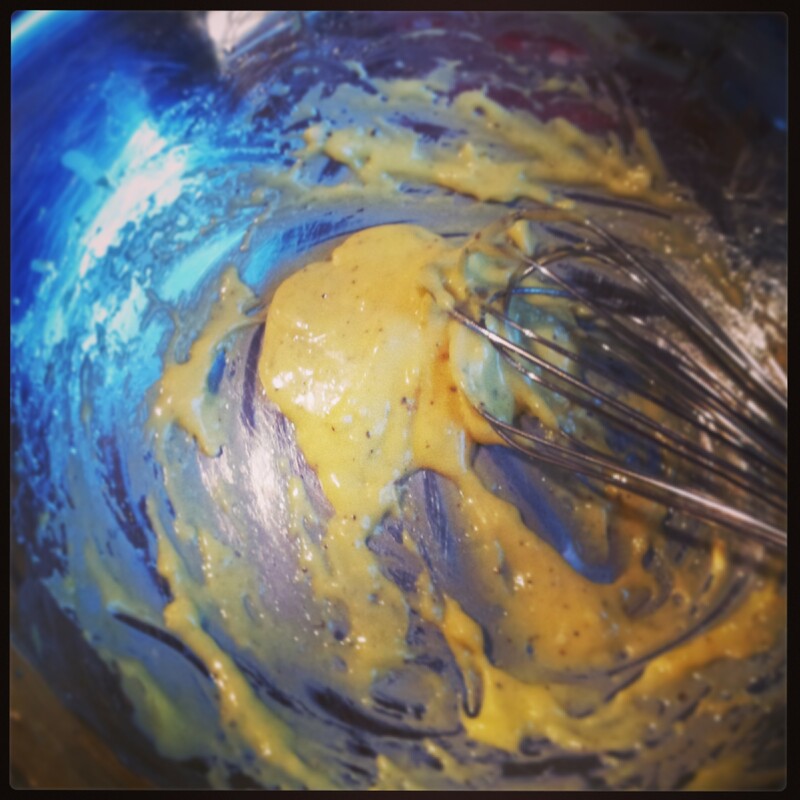 The mix should thicken and become creamy – you may not need all of the oil. Season with salt, pepper and lime juice to taste. 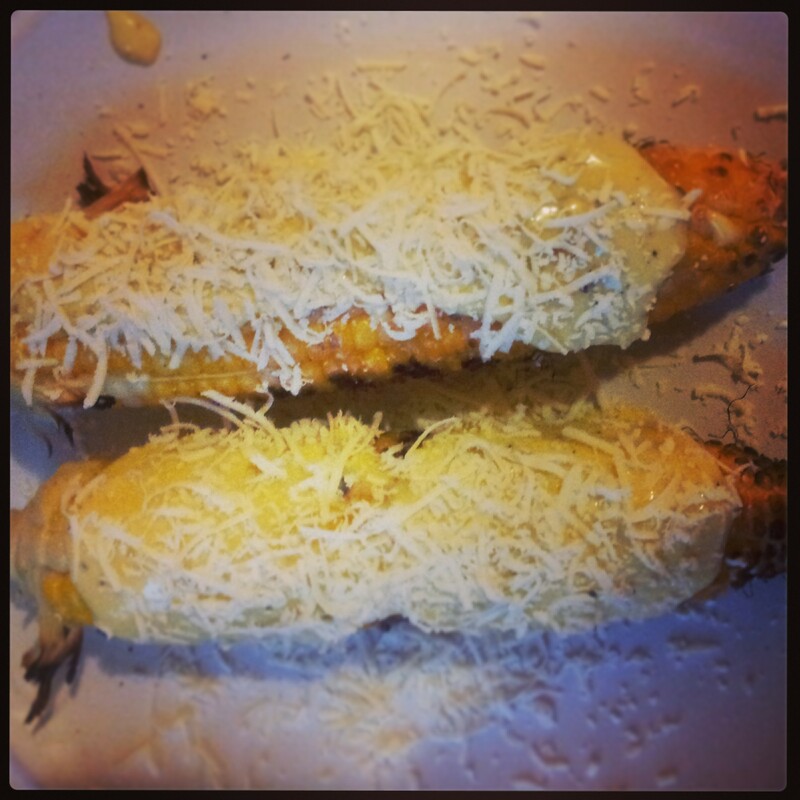 Serve the corn topped with aioli, grated cheese, and freshly ground black pepper. The eagle-eyed among you might have noticed, from this week’s photos and last, that I have not been in my Orange Kitchen. 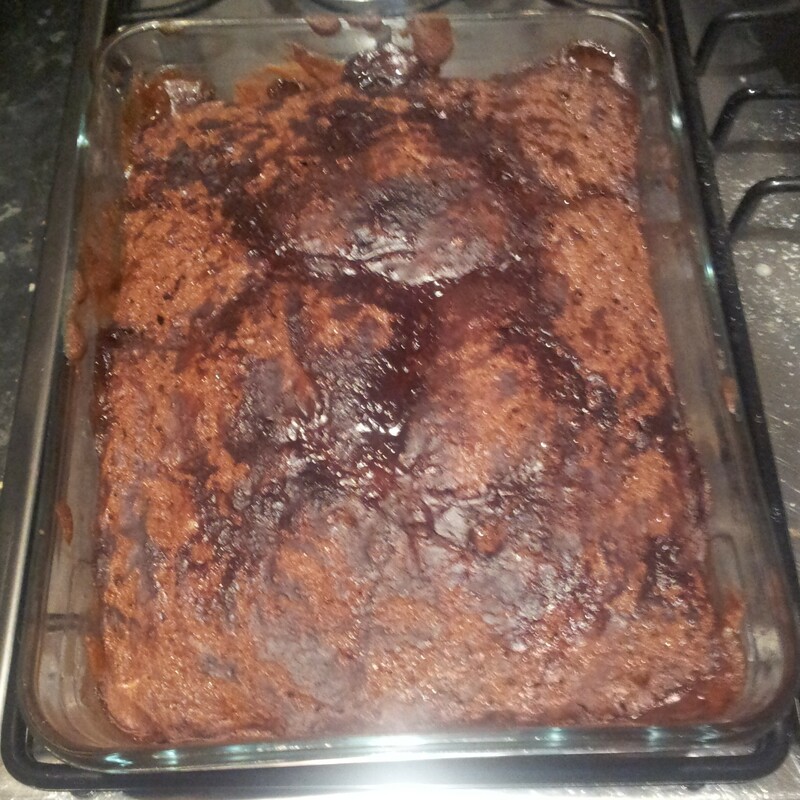 This is because I was in London for the past two weeks – and the photos in these two posts are taken in either my brother’s kitchen, or at Ollie & Anna’s house, for whom the Chocolate Pudding was made. I had to go back to London to sort out a new visa, which was a wonderful opportunity to catch up with friends and family. Sunday lunch x2: first cooked by Ollie, delicious beef, puffy Yorkshires, and Ollie’s speciality cauliflower cheese; and second in a London pub, catching up with old friends. Beer Wednesday & curry, lunch with friends, drinks with the girls from work, (the other) Ollie & El’s housewarming party, a lazy bank holiday Monday on the South Bank – I’ve been well and truly spoiled. And the weather – the weather was glorious! The very best of English spring/summer days: warm, but not too hot, maybe a light breeze. And is there anywhere more beautiful than London on a sunny day? This is the type of weather which begs for light, fresh food. My brother and I made a delicious supper the other day of a broad bean, pea, courgette, mint and feta salad, and some asparagus wrapped in parma ham with hollandaise sauce – so simple, and so delicious. Another night, I made a risotto with courgette and bacon. 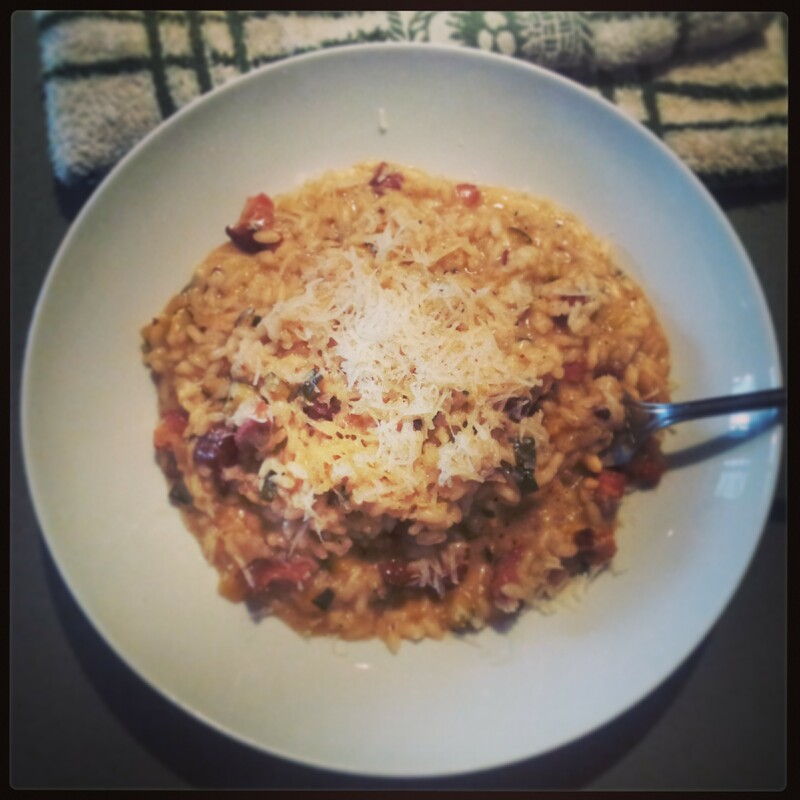 One of the things I love about risotto and pasta is how great they are all year round. You can have rich, dark, meaty pastas or a warm, comforting mushroom risotto in the winter, but just as delicious are the light, fresh pastas and risotto which make a feature of green vegetables. Courgettes are one of my very favourite vegetables. I love them any way they come – steamed, griddled, roasted, raw in a salad, all delicious in my book. 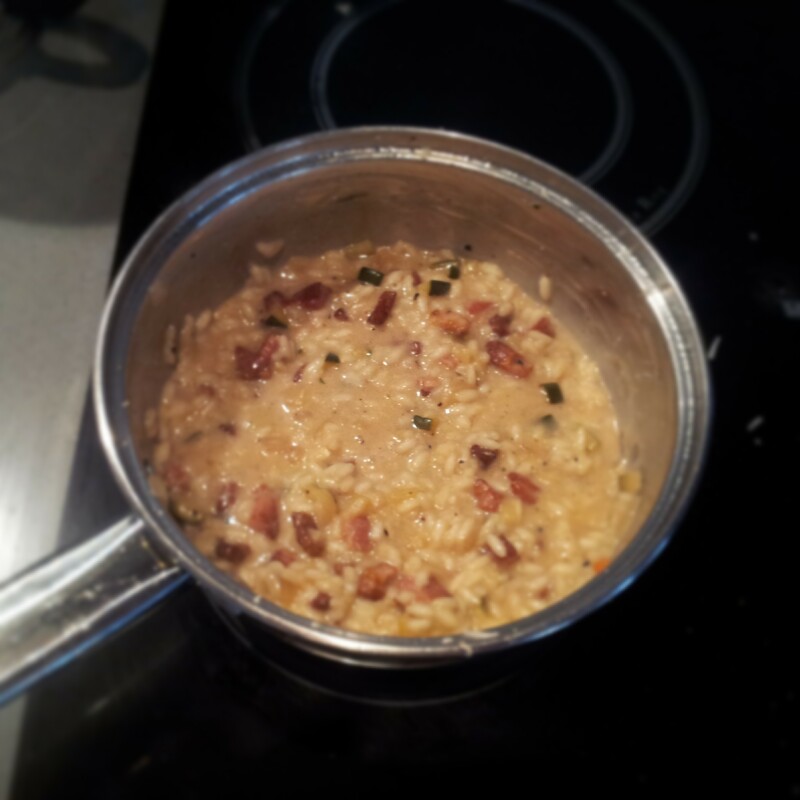 They marry really well with salty little bites of bacon, and the soft, almost creamy flesh is delicious in risotto. As with so many risotto dishes, this is very adaptable – last time I made it, I included lemon and pine nuts, and this time, I stirred through some leftover feta at the end. I think it definitely needs something like lemon or feta (different as those two things are!) – something sharp and zingy to lift it. 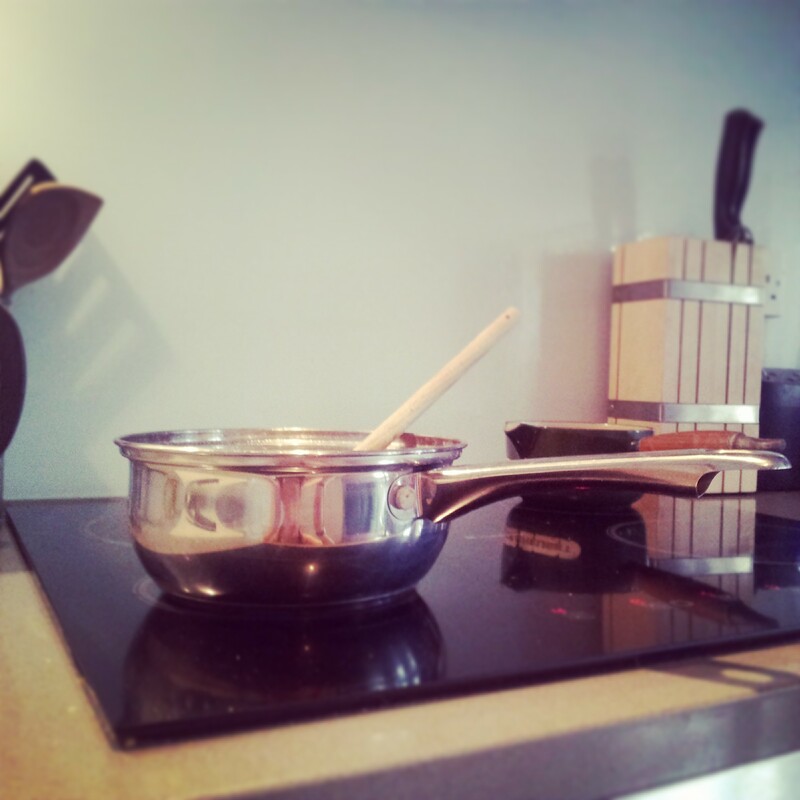 Heat a fairly large saucepan over a medium-high heat. 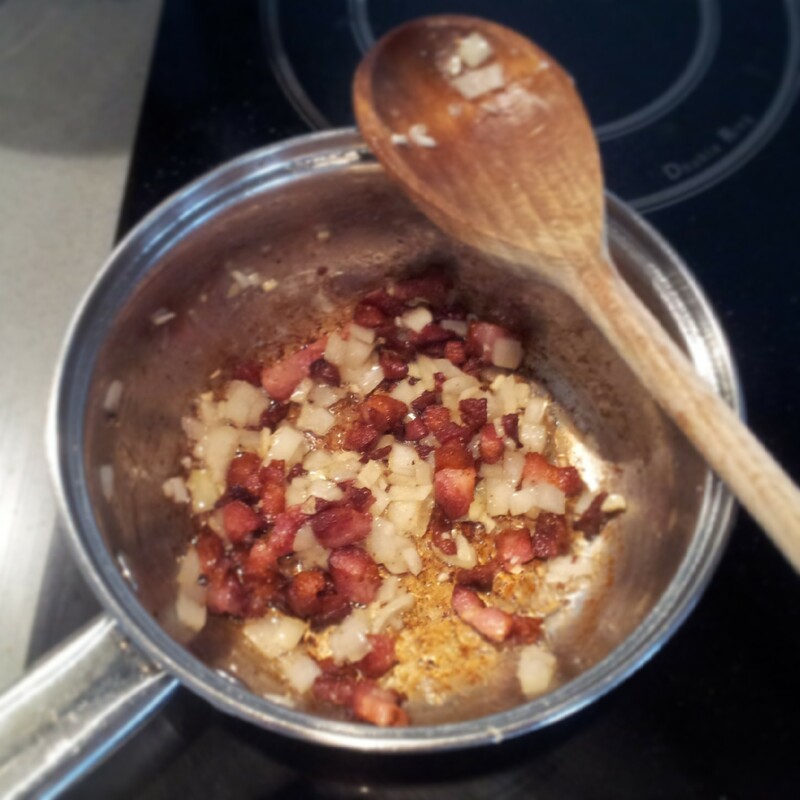 Add the cubed pancetta, and allow to fry until fairly brown and crisp. Once the bacon is crisp, reduce the heat to low, and add the onion and garlic. I find that the fat that comes out of the bacon means that you do not need to add any oil, but take a view on this and add a little olive oil if you feel it needs it. Soften the onions slowly until they are soft and lightly browned, and season with salt and pepper, remembering that the bacon is salty. In the meantime, in another pan, bring the stock to the boil, then reduce the heat to low and keep warm. 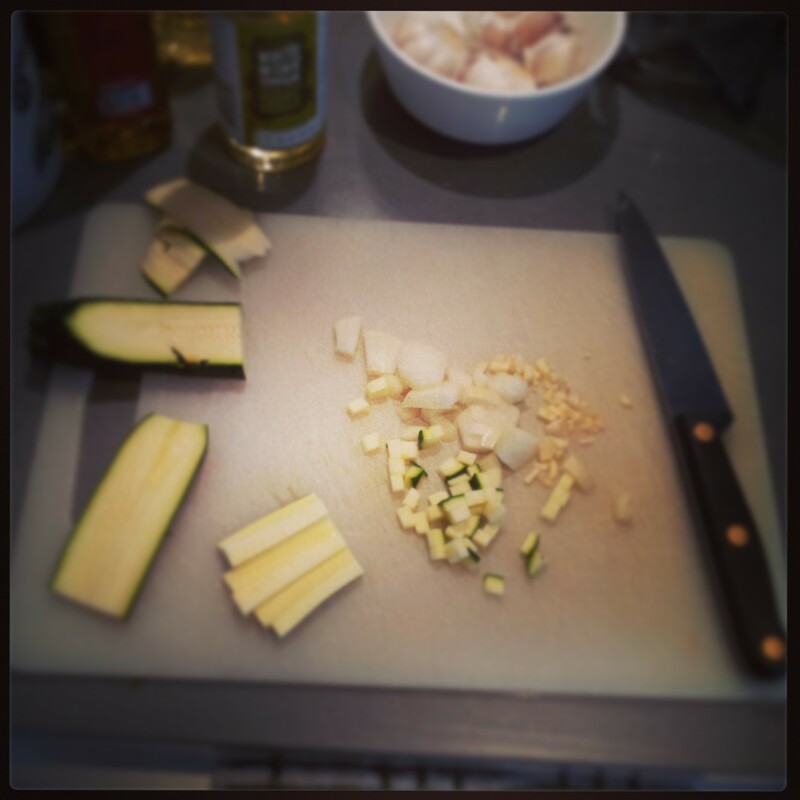 Once the onions are soft, increase the heat to medium and add the courgettes to the pan – cook for a minute. Add the risotto rice to the pan, and stir to coat the rice in the juices in the pan. Allow to cook for another minute or two, then add the wine. Stir, and allow the rice to absorb the wine. Add the stock to the pan a ladle at a time, and allow the rice to absorb the liquid before adding another ladle, stirring all the time. Continue this until the rice is soft and creamy but still has a little bite. If you run out of stock, continue with water. 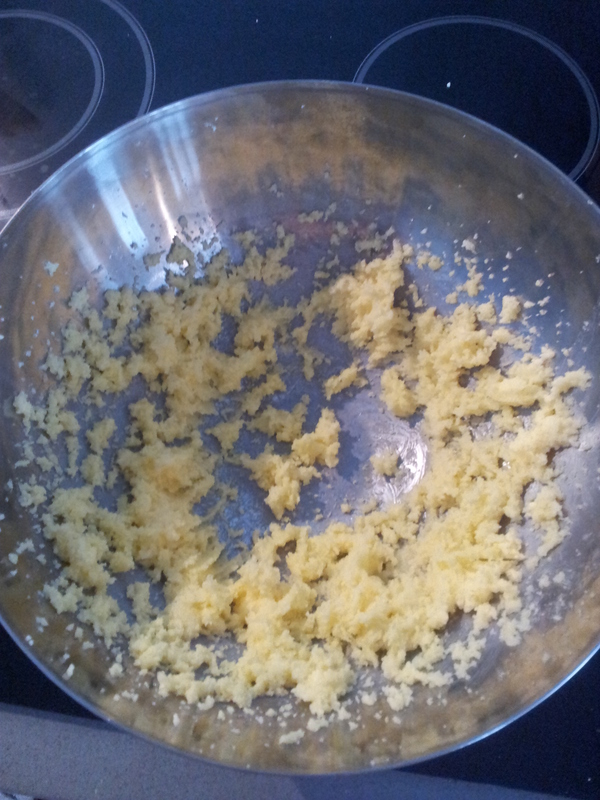 Stir the grated parmesan, feta and/or lemon through the risotto, and check the seasoning. Serve immediately, topped with more grated parmesan. One of my most enduring childhood memories is family Sunday roast dinners. Going back as far as I can remember, and continuing pretty much up until I left home, my family would sit down together every Sunday for a roast. When I was small, this usually included my mum’s parents, at our house or theirs. We would all meet after church, the adults would drink sherry, and we would be allowed a coke. Sometimes, we would be joined by friends and neighbours – leading to the now famous incident when I, as a small child, told my grandparents’ local MP off for not eating his vegetables. How embarrassing. We have been blessed with our grandparents: my dad’s parents retired before I was born to Alderney, in the Channel Islands, and we spent wonderful summers there as children. My dad’s father died when I was very young, and it is one of my real sadnesses that I didn’t know him better. Dad’s mum, however, was a big feature of our childhood, and in particular of our fantastic holidays in Alderney. My mum’s parents, in contrast, were much closer to home, and therefore more involved in day-to-day life. They helped with the school run, and we would sometimes go to them for a night or two for ‘holidays’ – which were probably holidays for everyone except them! They were truly magical times: my grandfather was forever full of magical tales and games; we would spend hours with him in the garden – ‘helping’ with his vegetable patch, building ‘fairy gardens’ (for the fairies to visit), and cubby holes for us to hide in. There were all sorts of fun things in the garden – his shed, which contained all manner of treasures, from a thurible (used for incense in church), to spades and saws and home-made furniture; a mini windmill thing (honestly, I can’t begin to describe it); and his pride and joy – his barbecue. As a red-blooded Australian male, his barbecue was of paramount importance, and his was a home-made triumph: constructed from an old metal oil drum standing on its end, with a section cut out and racks inserted for the coals to sit on, and an old sheet of metal on top to cook on. No barbecue before or since has come close. Speaking of cooking – there, as well, my Grandad had a unique approach. My Grandma was never an early riser – in fact, she would send us to bed with the words ‘sleep well, see you in the morning – not too early!’. Grandad was usually up early, and we would come down for breakfast with him. Tea and toast were central – very weak black tea with sugar, and toast dipped in it. To this day, when I want something comforting, I have ‘grandad tea’. His talents didn’t end there, and such classics as orange in a basket (an orange, with two almost quarters cut out of the top to create something like this, but with the orange still in rather than berries, and with sugar sprinkled on the cut sides), ketchup sandwiches, egg-in-a-nest (a piece of toast, with a hole in the middle with an egg cracked in and fried – like this), and Aussie chips (sauteed potatoes, to anyone else…) were legendary. Where my Grandad is an outdoors kind of chap, who would prepare breakfast in his vest and pants, and taught us to clean pans with dirt ‘like in the army’, my grandmother was the opposite: always stylish, beautifully turned out, and glamorous to a fault. They went to Australia every year to visit their other children and grandchildren, and the family joke was that Grandma would take an extra suitcase for all the shoes and handbags she would buy! Where he was always early, she was always late – he used to sit in the car when he thought it was time to leave, and she would come out when she thought it was time to leave. On paper, you couldn’t find two more different people – but they were married for more than 55 years, until she died 10 years ago this year. She was also a great, if slightly unorthodox, cook – her recipe scrapbook was full of gems. 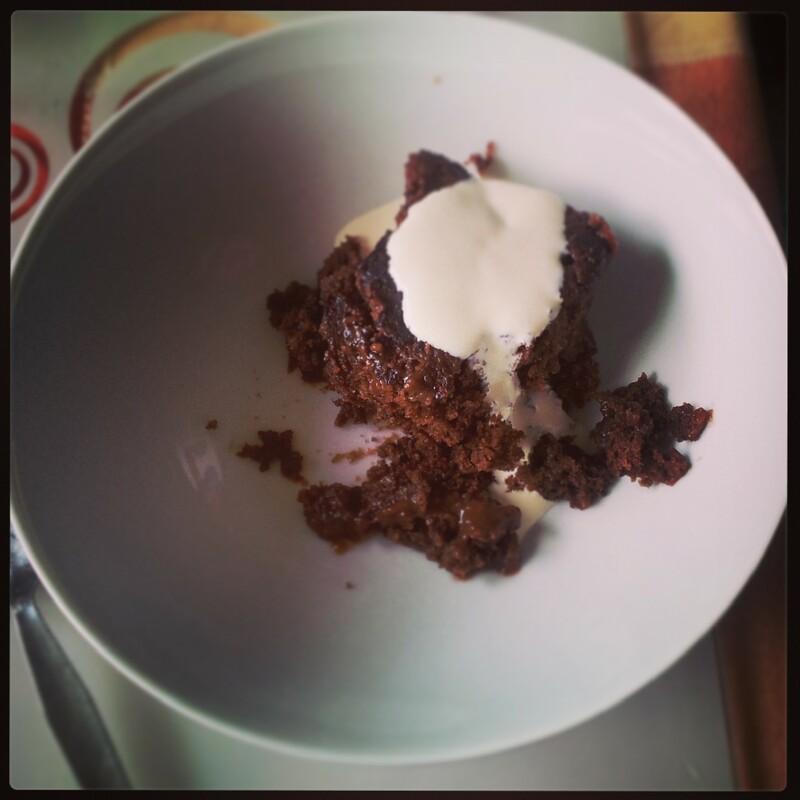 One of the best things about our Sunday roasts was Grandma’s chocolate pudding – in my mind, we had this every week, although I’m sure that can’t be true… Either way, it is so delicious, and simplicity itself to make. Which seems like a very good approach to me!! 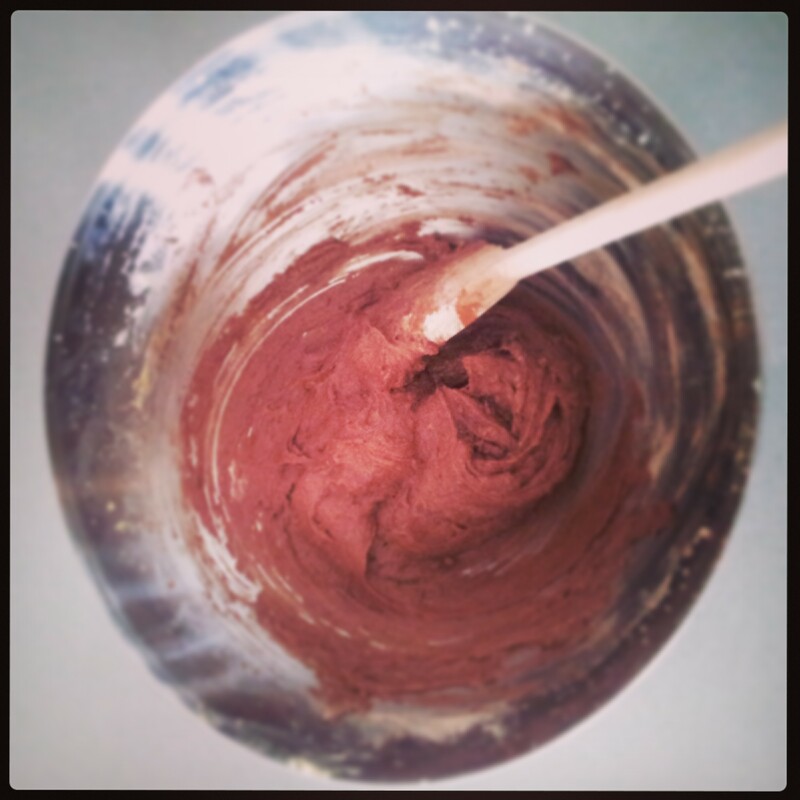 6oz / 170g self raising flour and cocoa mixed: add 2-3 tbsp cocoa to the measuring bowl, then add enough flour to bring it up to 6oz. You can use more or less cocoa, to taste. Preheat the oven to 175C / 350F. 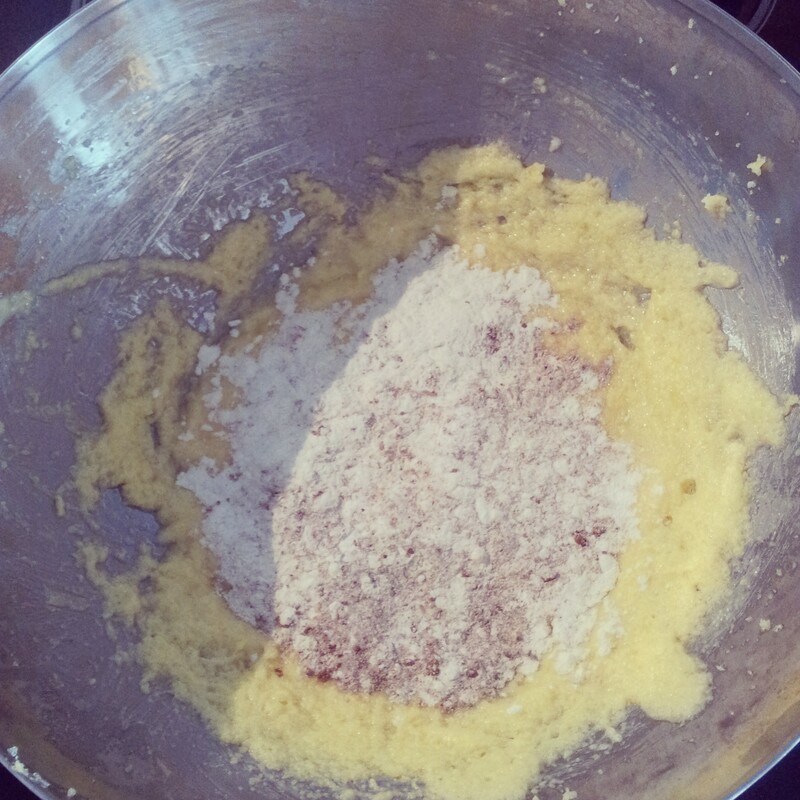 Cream the sugar and butter together until they are light and fluffy. Beat in the eggs. 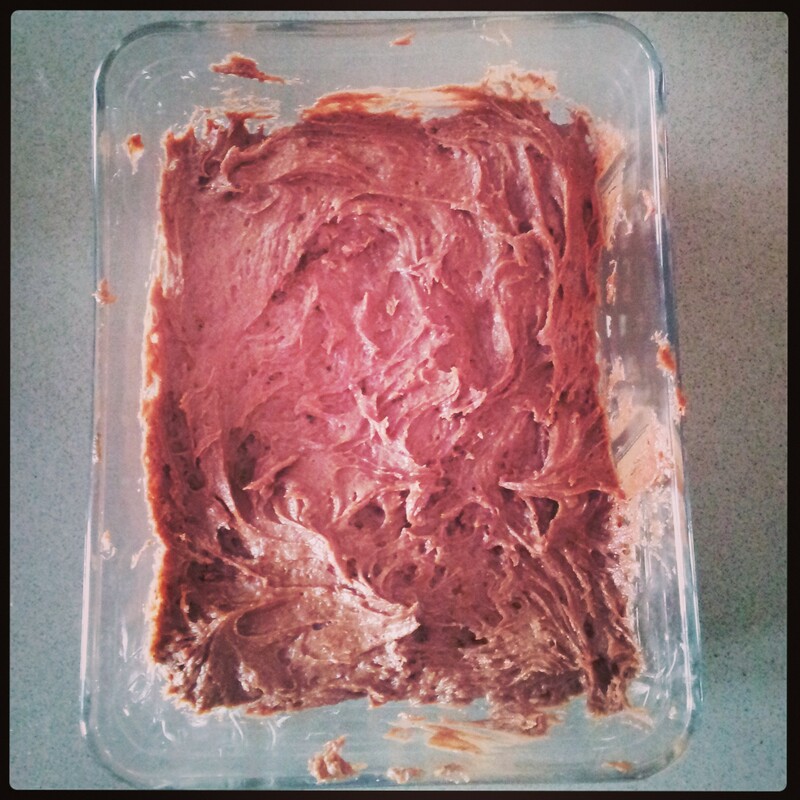 Gently fold the flour/cocoa mix into the batter. Grease a baking dish (the one we used was about 8inx6in), and spread the mix in the dish – you need to make sure there is at least 1.5in between the batter and the top of the dish. 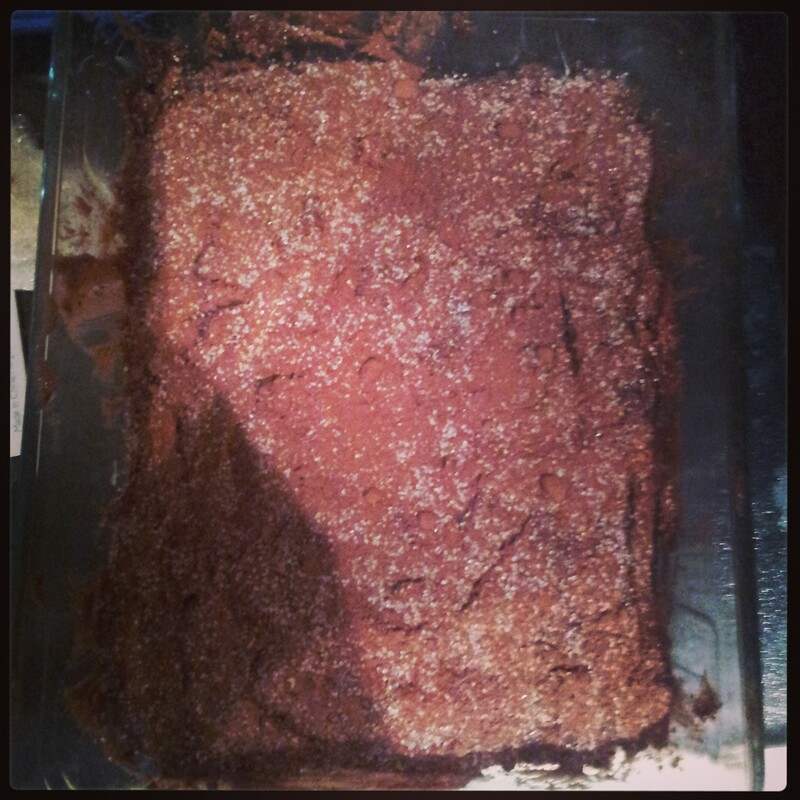 When you are ready to bake, sprinkle the sugar and cocoa over the dish, and pour over the water. 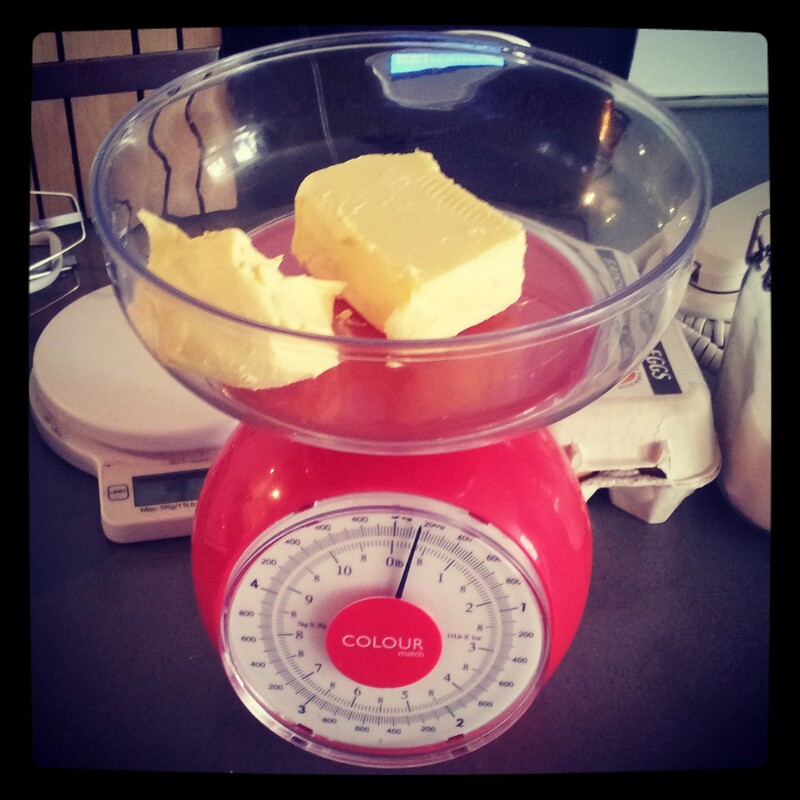 The amount you use will depend on the size of the dish – you are looking for all the batter to be covered by about 1cm water. Bake for around 30-40 minutes, until the top is shiny and slightly cracked. What's on my plate today! !